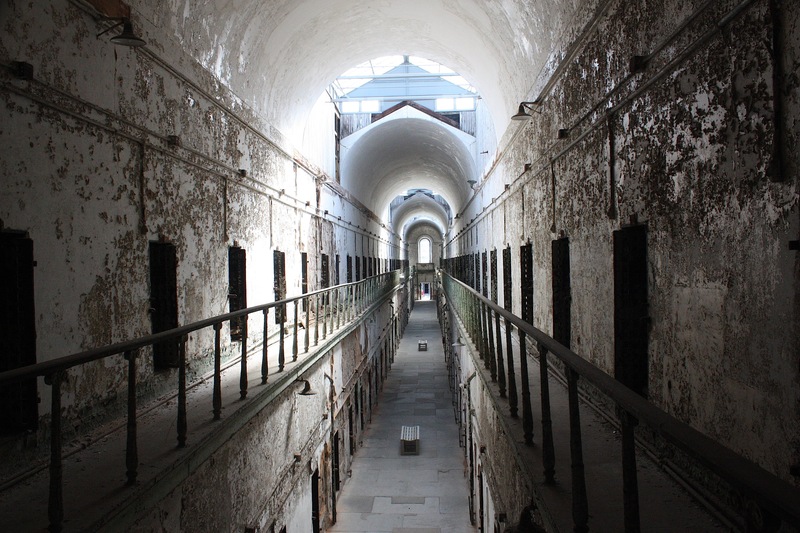 My recent adventures out of the state of Iowa took me to Philadelphia, New Jersey, Connecticut, and New York with my friend, photographer, and intrepid traveler Jim Heemstra. As always, even though we were traveling for work, we managed to find time to eat good food and have a lot of fun. 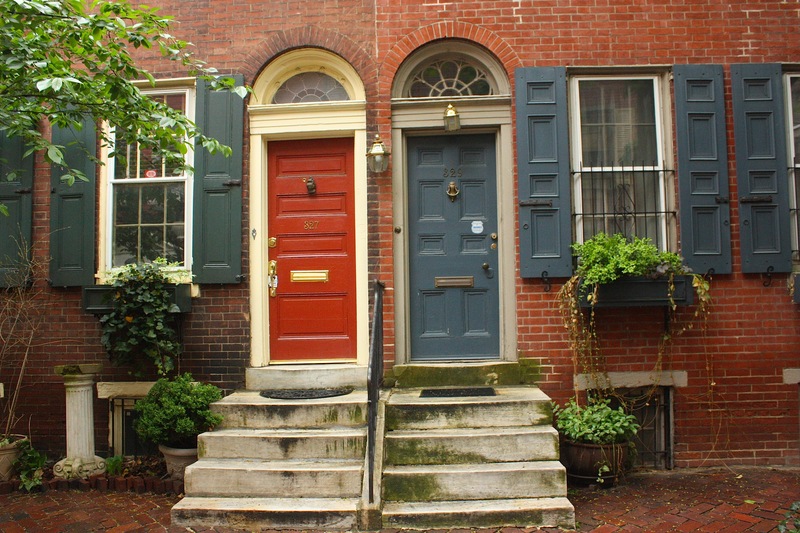 We stayed in historic Alexander Inn at 12th and Spruce in Philadelphia’s City Center. 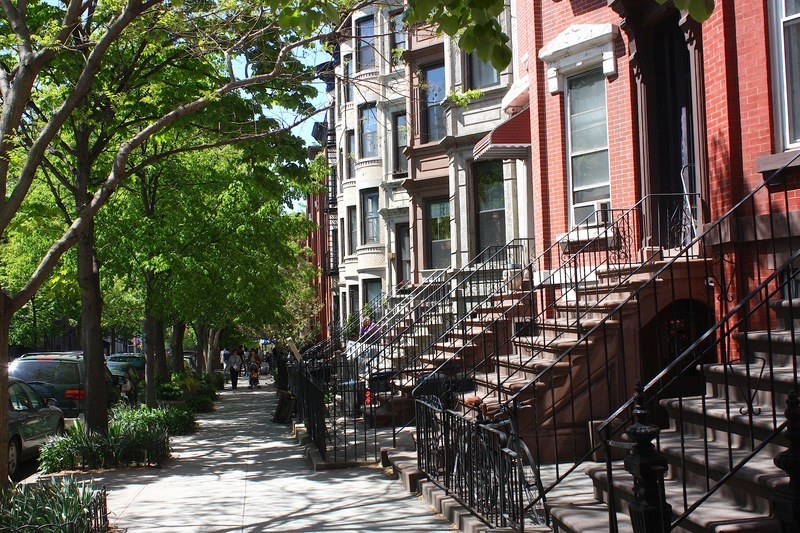 It was a great neighborhood, with historic architecture and wonderful restaurants within easy walking distance. The rooms are small, with sort of a European-hotel feel to them, but the price was reasonable and we only had to park about three blocks away for an extra $15 a day. 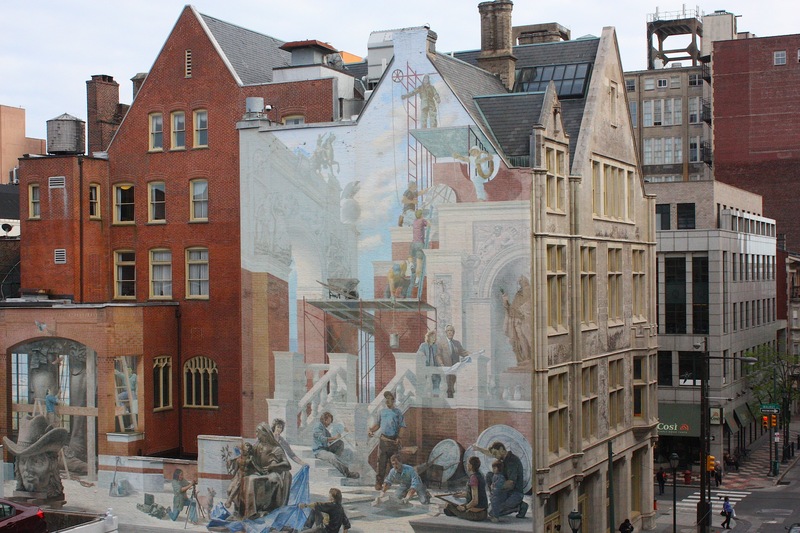 Beyond murals, Philadelphia is just such a great walking city. The architecture is grand, as is the history and culture. 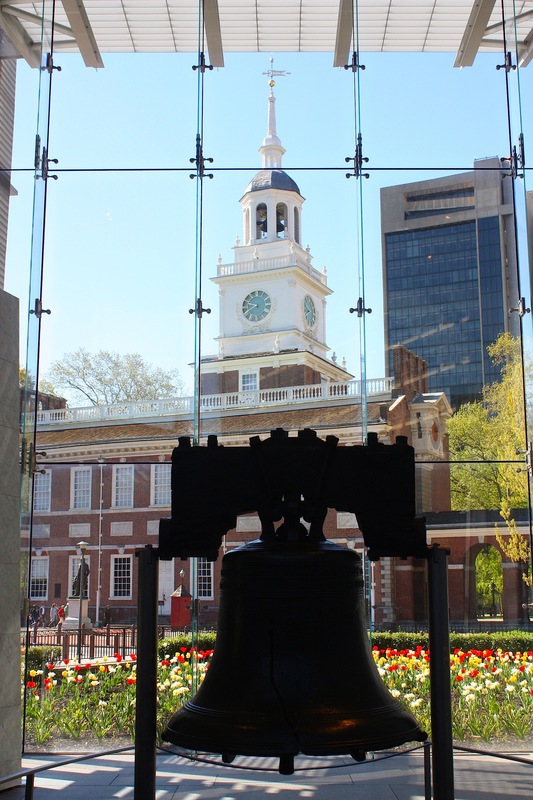 We did visit the Liberty Bell, but it was not a highlight. I preferred the parks and squares, especially Rittenhouse Square. Frommer’s guide recommended stopping for a latte at Parc Bistro next to the square, so we did that one morning and watched the world go by. We had time after one of our morning interviews/photo shoots to take the Atlantic City Expressway (just a short drive from Philadelphia) to Atlantic City. 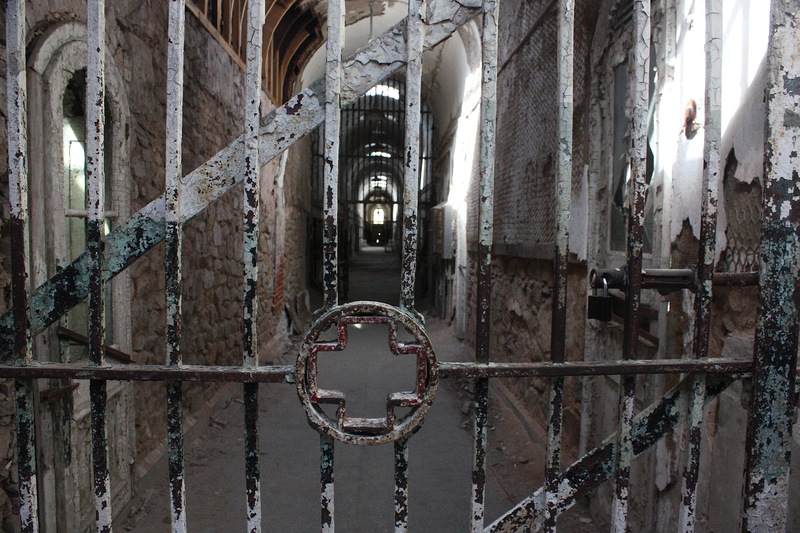 I’ve always wanted to visit this place, just to see what it’s like, but I was under the impression that it had been damaged so much by Hurricane Sandy that it would never be the same. That made me sad. 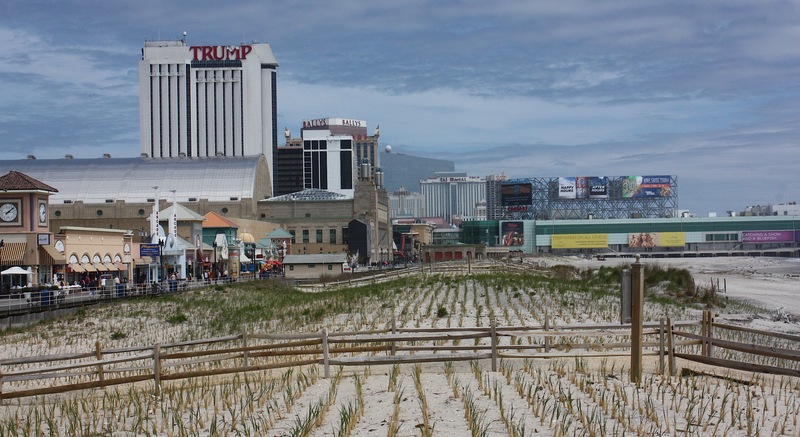 I did a little research before we left on our trip and learned that the damage was overhyped by the media to the point that Atlantic City is really struggling to get back its conventions and tourism. 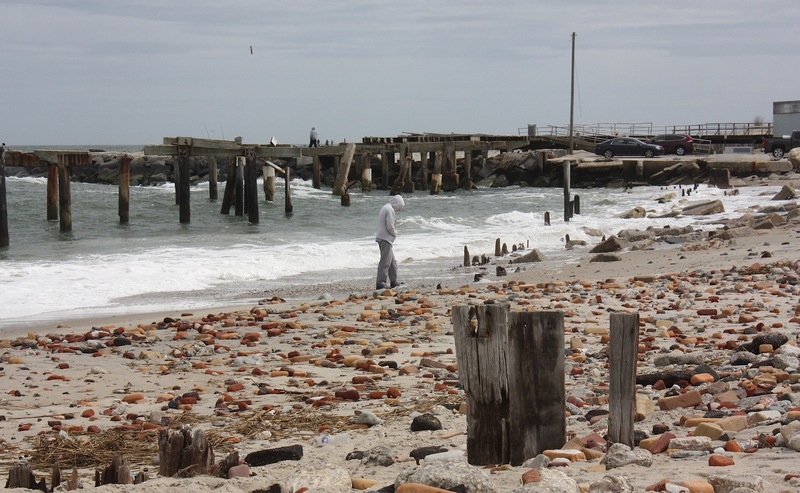 The portion of the famous boardwalk (at left) that was destroyed by the storm (and shown over and over on TV) was not really part of the main walkway, and it was actually scheduled to be removed. So even though the town did get hit pretty hard by the storm, the main tourist section and the historic areas looked just fine to me. Atlantic City is a kind of Las Vegas/Coney Island hybrid, with casinos and hotels and outlet malls mixed with ice cream vendors and souvenir stores and an authentic seashore/resort vibe. 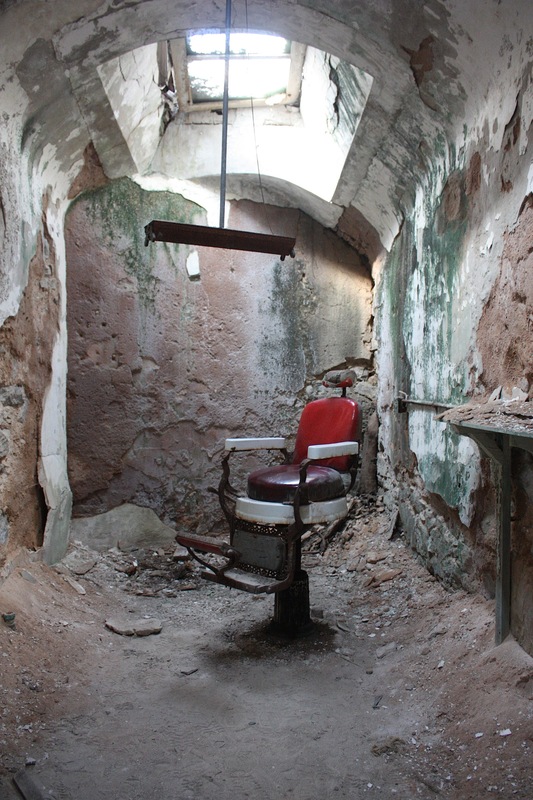 I’m not sure I’d want to spend a lot of time there, but it was fun to explore. 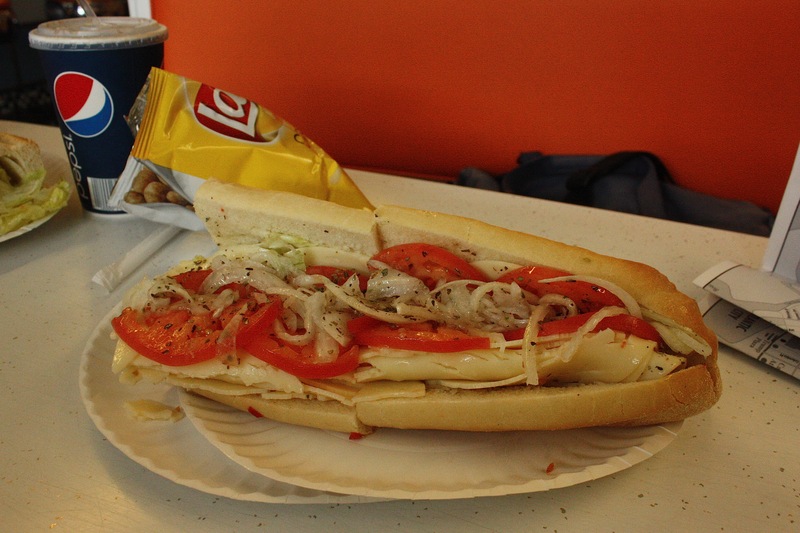 We ate lunch at the White House Subs sandwich shop on Arctic Avenue – apparently a destination diner since 1946. We walked the boardwalk and the adjacent beach, thought about eating ice cream (but didn’t), and visited the damaged part of the beach/boardwalk, near the Absecon Lighthouse. 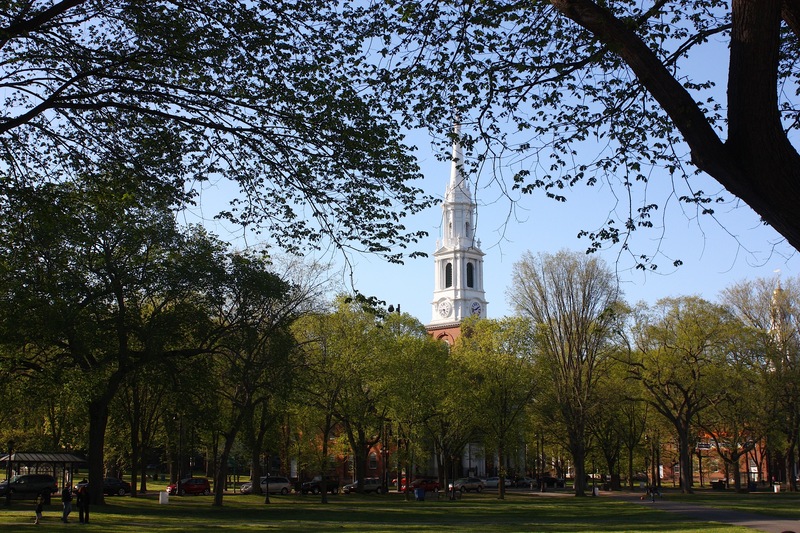 We spent one night near New Haven, Conn., home of Yale University. Jim and I both love to visit other college campuses, so walking on Yale’s Old Campus (with its Gothic architecture) and the New Haven Green was a real treat. We also ate some of the famous New Haven-style pizza at the original Frank Pepe Pizzaria Napoletana. Established in 1925, Pepe’s is said to be one of the oldest and best-known pizzerias in the United States. Its signature pie is a white pizza with littleneck clams. I’m a fan of white pizza but not so much the clams so I ordered mine with spinach instead. 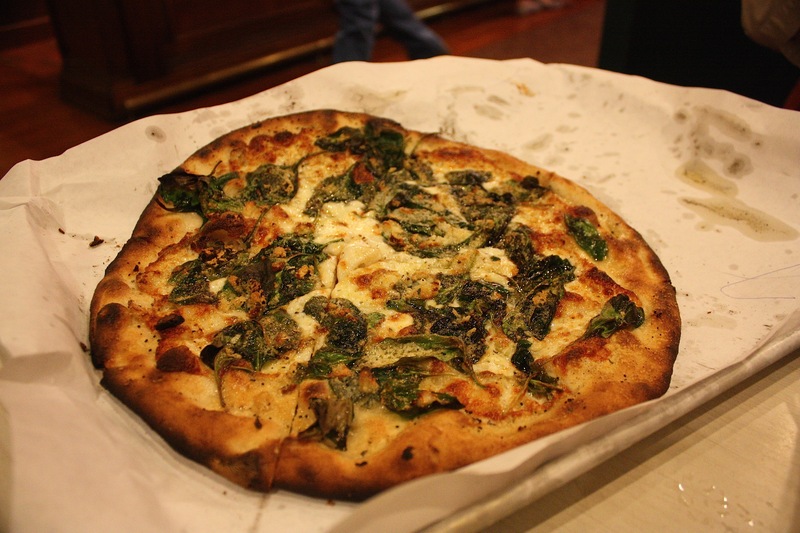 New Haven-style pizza has a thin crust and is cooked in a very hot oven fired by coal. What the website and tourist brochures don’t tell you about this famous restaurant is the random and bizarre seating arrangement in which you wait your turn (forever) in the entryway or out on the street (depending on the line) and then get bad service from your waitress. I literally saw our waitress chase a customer out of the restaurant for a bigger tip and then complain to the other customers about it. Eating here was a strange experience, but I thought the pizza (and the local weirdness) was worth it. 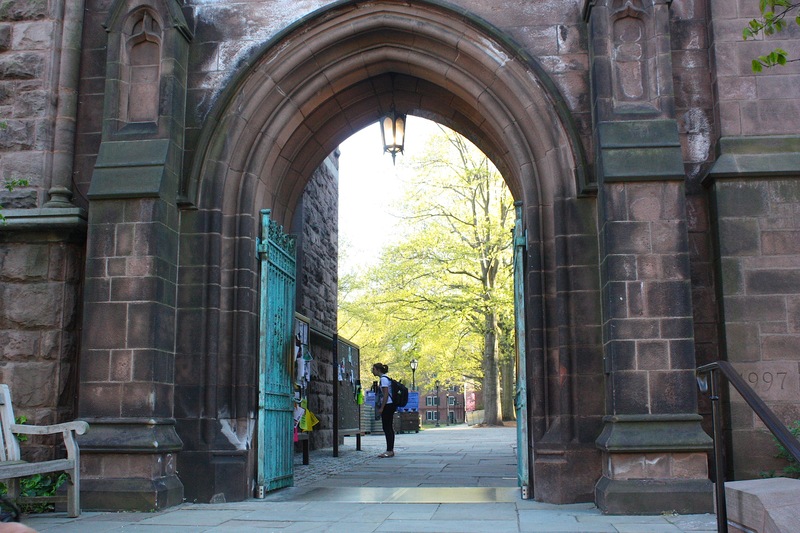 The original Pepe’s is located at 157 Wooster Street – within walking distance of the Yale campus. Ah, New York. How I do love you. I’ve lost track of the number of times I’ve visited this city. I’ve stayed in many parts of New York since my first visit 25 years ago, but I had never stayed in Brooklyn. Honestly, it never occurred to me. On this trip, given the cost of staying in Manhattan, I researched lodging in Brooklyn and found it to be much more affordable. 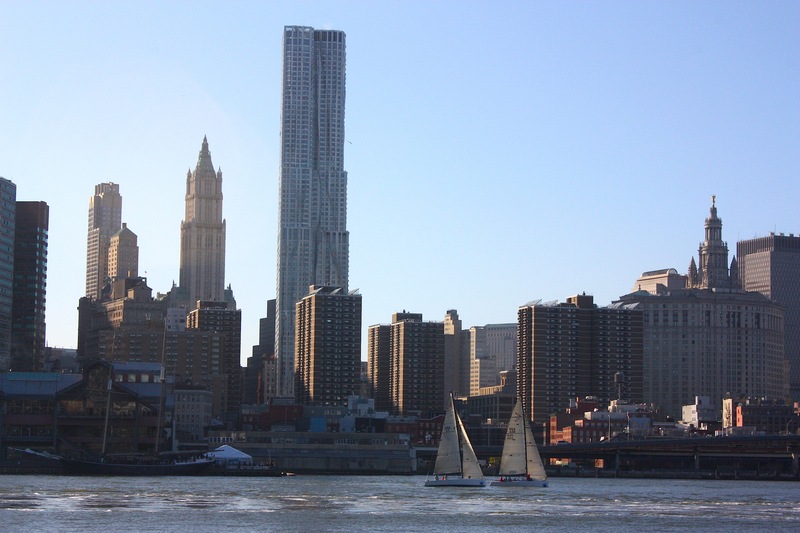 With the convenience of the subway, you can just zoom to Manhattan in 20 minutes, give or take. And – at least where we stayed, in the Prospect Heights/Park Slope area – it was utterly charming, surrounded by a thousand yummy restaurants, shops, row houses, shady streets, and young parents pushing strollers. 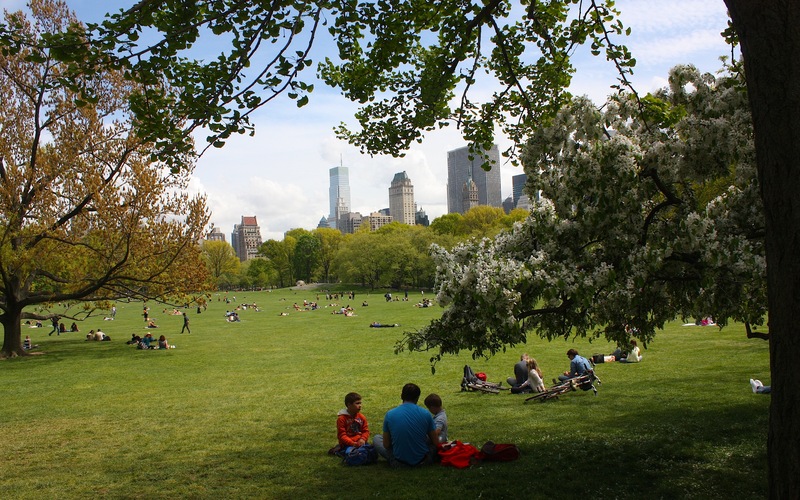 We were close (in the Sofia Inn, 288 Park Place) to the famed Brooklyn Botanic Garden and the lovely Prospect Park, a 585-acre public space that rivals Central Park. 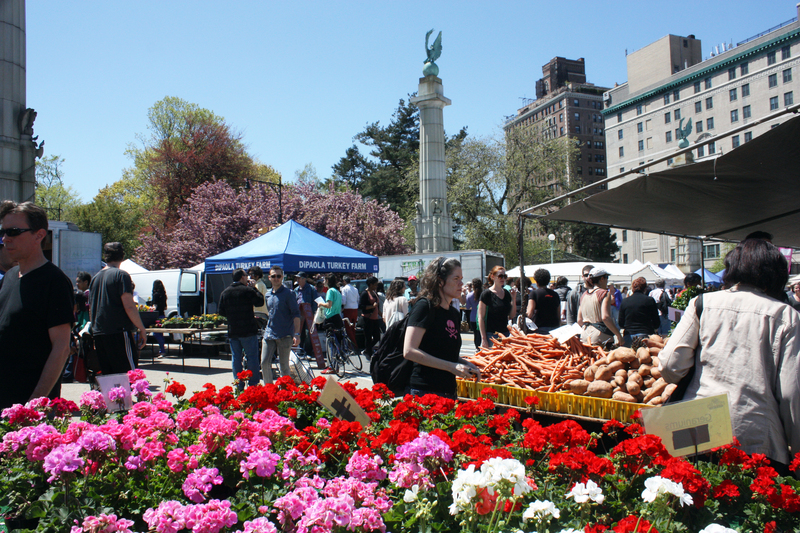 We arrived in Brooklyn on a picture-perfect Saturday and (after settling in to our inn) immediately stumbled on a farmers market at the edge of Prospect Park. After a stressful morning driving from New Haven to Newark (through the Bronx) and hauling our luggage and equipment via car service to Brooklyn, I could think of nothing better than sipping a cup of café Americano and eating a muffin on the lawn, watching real Brooklynites enjoy their Saturday afternoon. Later in the day, after walking what felt like the length and breadth of Brooklyn (but, of course, was not because Brooklyn is huge), we went to Brooklyn Bridge Park to watch the sailboats and see the sun set behind the Manhattan skyline. 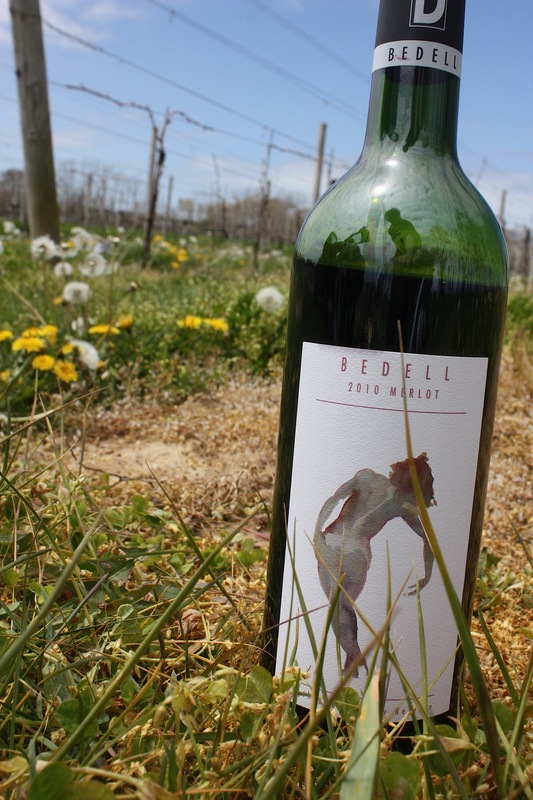 The rest of our time in New York was filled mostly with work, but what a great job I have: I spent a full day with an Iowa State alum who is the CEO of Bedell Cellars winery and vineyard on the North Fork of Long Island. Yes, I drank wine on the job and I’m not ashamed. 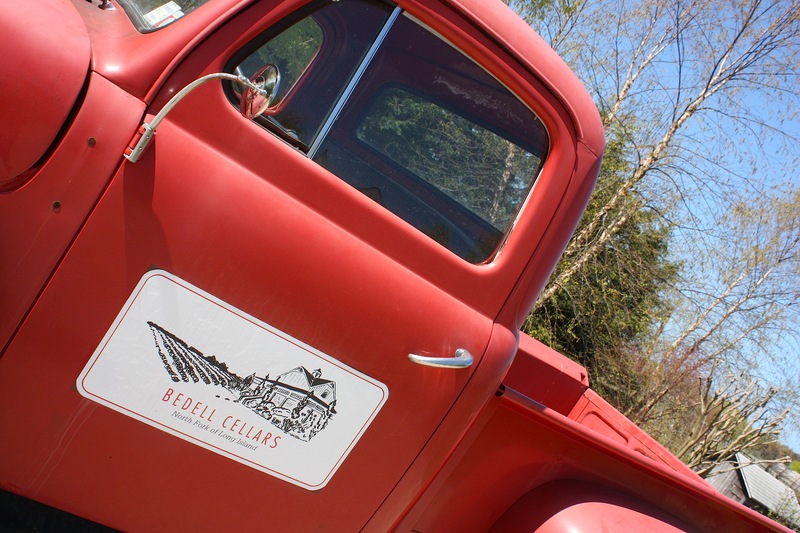 We toured the agricultural region of the island (Long Island, it turns out, is way more than just the Hamptons) and the charming villages and oyster farms that felt more like New England than New York. We ate good food, drank good coffee, and then Jim and I hopped aboard the Hampton Jitney, a very comfortable bus that took us back to Manhattan, at which point we walked to Grand Central Station and subbed it back to Brooklyn. We also spent a day with another alum on a sailboat on Long Island Sound. Said sailboat was launched from the Larchmont Yacht Club (near New Rochelle), and the experience reinforced my self-awareness that I am, at heart, a Land Person. We also spent time with her (and her very patient and supportive husband) in Lower Manhattan and in Central Park, so it was quite a day. On our last full day in the city, we met another alum at Carnegie Deli (a good place to eat cheesecake and sandwiches bigger than your head) with the idea that we would photograph her at Carnegie Hall since she’s a professional musician who’s played there many times. 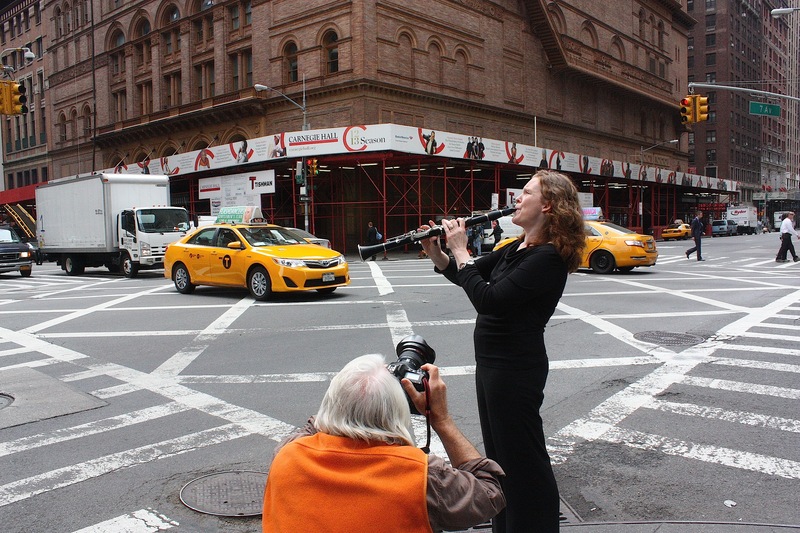 The fact that the lower quarter of Carnegie Hall turned out to be covered in scaffolding did not deter Jim; he literally lay down on the sidewalk to photograph our musician friend playing her clarinet with the skyscrapers jutting up behind her. At one point, when I said I felt like I was in a Woody Allen movie, she played Gershwin’s Rhapsody in Blue – and that might have been the highlight of the trip. After that, our work was done, and my adrenaline came crashing down. We actually struggled to decide what to do with the rest of our day IN NEW YORK CITY. We must have been really tired. 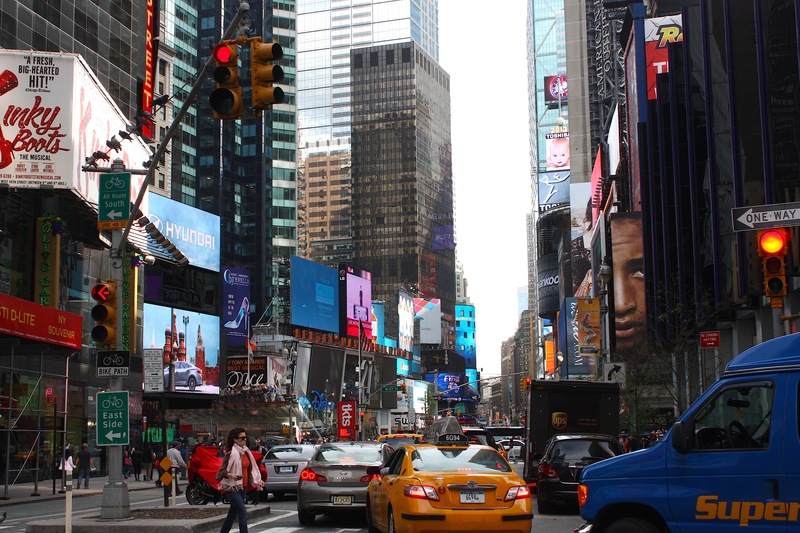 So we came up with this plan: Walk to Zabar’s to get food for a picnic in Central Park, then hang out in Midtown, eat dinner at Ray’s Pizza, and take pictures of Times Square after dark. Bought food at Fairway (W. 74th and Broadway) because it’s closer than Zabar’s (W. 80th and Broadway). We got a loaf of Jewish sourdough rye, two kinds of cheese, a kosher dill pickle, and a black-and-white cookie. I accidentally dropped a pickle on the floor, but nobody seemed to notice. 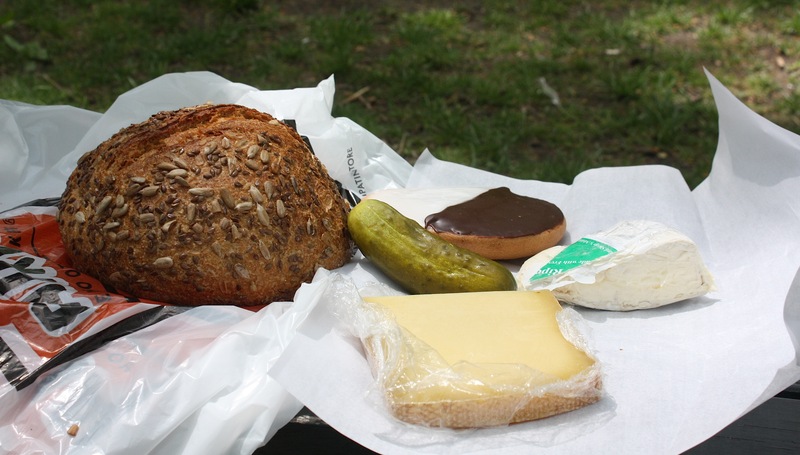 We schlepped the bag of food to Central Park and ate lunch on a bench. And then we sat on that bench for a long time. Walked through Central Park (above), stopping often to sit on more benches. Bought souvenirs at the first tacky souvenir store we found. 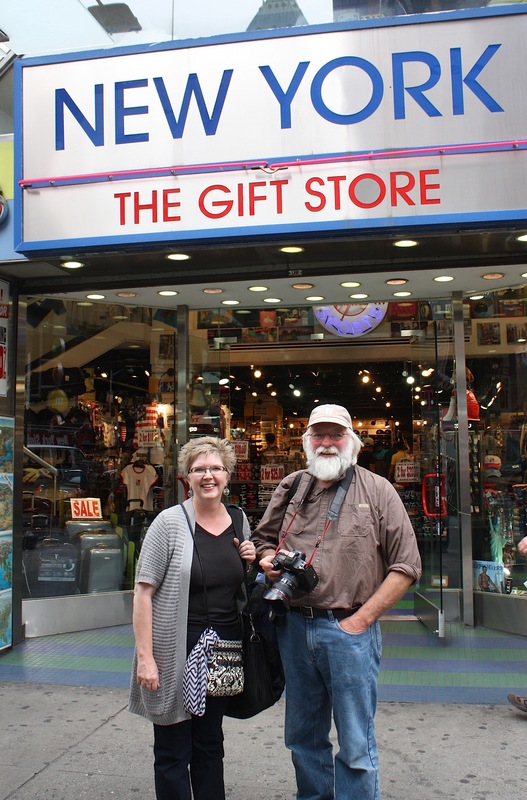 Got our picture taken in front of a different tacky souvenir store in Times Square. Drank a beer at a bar on 8th Ave. Walked to Bryant Park (42nd and 6th Ave or thereabouts) and listened to a free concert by Straight No Chaser. Tried to find Ray’s Pizza but gave up and ate not-Ray’s pizza, which was not as good as Ray’s Pizza but we were so tired we didn’t care. Took pictures of Times Square after dark and then took the subway back to Brooklyn. And I thought that one of the benefits of women’s lib would be comfortable shoes… What are they doing to their feet? Great pictures, as usual.